Q. I have seen a memorial I like, but I cannot find it in your catalogue, can you help me? Yes, we can quote for any Memorial from any catalogue or from photographs. Q. I would like to see a draft of how my inscription would look on the memorial. We always send our customers a template of how the inscription is to look before placing it on the memorial. This is always subject to customer approval. Q. I would like a special design on the memorial. We have many designs on our computer, ranging from animals, football badges, flowers, religious symbols, sporting emblems etc. Alternatively, if you have a favourite picture or badge you would like embossed onto your memorial, we can do this for you. Some Burial Authorities require 6 months to allow the ground to settle before a memorial can be fitted. This safeguards against subsidence, which is common in the more established graveyards. Some burial grounds have a concrete plinth placed at the back of the grave to allow for immediate installation. 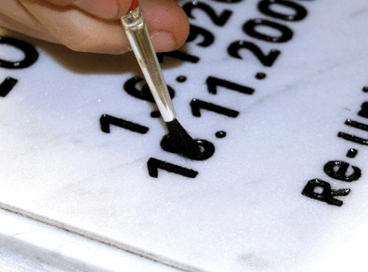 A cremation memorial can normally be fitted once the ashes have been interred. No. Some Churches and Cemeteries have rules & regulations about what type of memorials they allow. We will advise you. Q. Do you install the memorial? Yes, our price will include the installation of the memorial at the Cemetery/Churchyard. A NAMM approved anchor system is a safety device that is secured into the ground and the memorial to prevent it from falling. A Grave Owner is the person who holds the deeds for the plot. In most cases it is the person who arranged the burial with the Local Authorities. Yes you can, providing the Grave Owner has no objections and is willing to give permission by signing the relevant paperwork. Q. What are Cemetery/Churchyard fees? The local authority i.e. local council for cemeteries or vicars for churchyards charge a fee for the right to erect a memorial. This fee covers administration costs and Cemetery/Churchyard upkeep etc. Cemetery fees vary from council to council. We can find this out on your behalf or you can ring the council in charge of the cemetery to find out. The fee charges can vary dependant on the type of memorial, whether it is a new memorial, a replacement or renovation. The fee may also be dependant on whether or not the deceased lived in the local area. Q. Do I have to get the permission from the council/vicar? No, we do this on your behalf. The payment of the application fee is paid to us with your memorial payment. When the application is ready to be submitted to the Council/Vicar we will submit your fee, which will be a cheque from A K Lander. We do not charge any extra for this service.